Who Is Robin Robins And Why Should You Listen To Her About Marketing And Selling Managed Services Contracts? There is no doubt about it: Robin Robins has helped more MSPs to not only get their managed services offering launched, but also to implement an effective managed services marketing plan to attract the "sweet spot" clients every MSP dreams about. 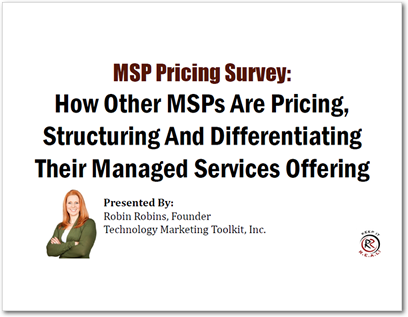 She has also developed a very powerful Managed Services Sales Playbook (process) that is designed to allow MSPs to close more contracts at higher price points with less sales resistance, stalls, delays and discounting. Since creating the Million-Dollar Managed Services Blueprint over 10 years ago, 1,876 MSPs have enrolled in that program and have used her lead generation and sales strategies to bring in more MRR (managed recurring revenue). 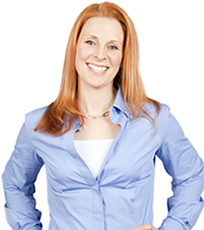 To date, Robin has worked with and consulted over 8,000 IT services business since starting her consulting practice in 2001. During that time, she's been heavily involved in helping her clients transition to a more secure recurring revenue model. While most of her clients are MSPs (or are working to evolve their business model to a managed model), Robin has a large number of clients who sell application development, HaaS, SaaS, telephony and Internet solutions, point of sale solutions and many other IT services. Crafting highly effective lead generation campaigns to attract "sweet spot" managed services clients, both for large enterprises, small and mid-size companies and even home users. Creating managed services sales playbooks and processes to close more sales at a higher price point without discounting, neediness, heavy sales pressure or out-of-date sales tactics. Helping MSPs get out of overwhelm, eliminate procrastination and overcome their own inertia to IMPLEMENT a sales and marketing plan with confidence. Identifying the most lucrative target market for your managed services firm. Positioning strategies that elevate you from "just another" sales guy to a trusted IT and business consultant. Online AND offline marketing campaigns for selling managed services including websites and SEO strategies, e-mail list building and marketing, strategic partnerships, direct mail, trade shows, LinkedIn campaigns, telemarketing for appointments and dozens more.